I’ve traveled across America many times, and I just returned from a 5,000-mile transcontinental, weeklong journey to Danville, California, a beautiful town in the San Ramon Valley in Contra Costa county, east of San Francisco and Oakland. In 1844, when the first wagon train started at the Missouri River and arrived in California, it required anywhere from two to four months to cover the 2,000 miles. I did it from my home in Florida in a little over four hours. Indeed, family was the compelling reason for my journey. 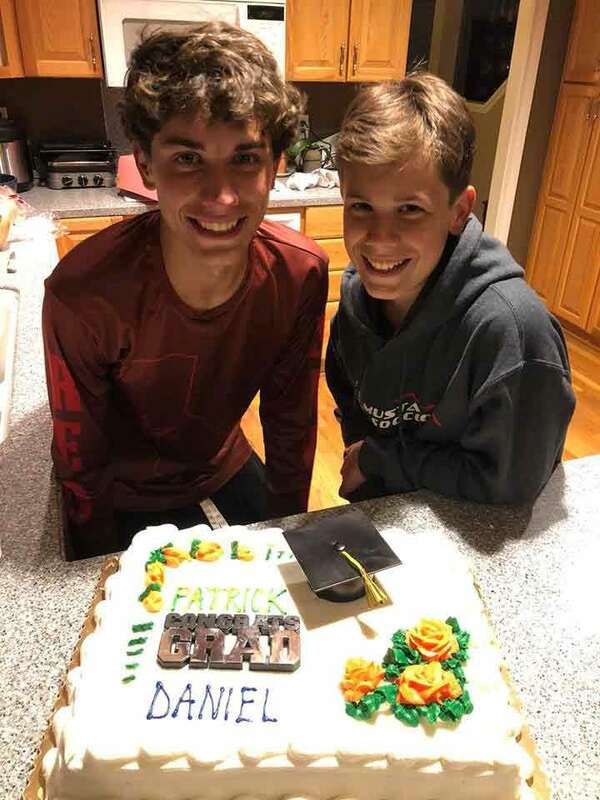 Two of my six grandchildren graduated last week: Patrick, 17, from high school and Daniel, 14, from middle school. And there were lots of hugs and smiles. They are two of the three boys from my youngest son, Jim, and their mother, Kathleen. Their older brother, Conor, is now in college. All three honor their parents as good students, as well as excelling in Ultimate Frisbee, a rising American team sport recently featured in The Wall Street Journal. Grandpa Bob, as I am known in family circles, was joined for the celebration by their grandmother, Carol Dawson, and my daughter, Vicky, as well as their maternal grandparents and uncles, aunts and cousins. Highlights: Daniel’s graduation from middle school, and a day later, Patrick’s graduation from high school. The latter was held outdoors in a football stadium to accommodate the nearly 300 graduates and friends and families. As a former member of the U.S. Congress, I’ve attended my share of these academic exercises. Conferring of diplomas with young people marks the culmination of four years of hard work and the start of a new chapter in life. It is altogether fitting and proper to celebrate this important milestone with awards, speeches, singing and music. In our hometown, we enjoyed all this and perfect weather. Teachers and students were speakers, but no politicians. Sir Edward Elgar’s traditional “Pomp and Circumstance” served as the processional and recessional march at Patrick’s commencement, but a recorded version. That same music played at my 1955 Capitol Page School graduation, in the ornate House of Representatives Ways and Means Committee room. Then the music was provided by the President’s Own, the U.S. Marine Band. A son of California, Vice President Richard M. Nixon presented each of us our diplomas, signed by President Dwight D. Eisenhower. My long-ago graduation was not as impressive as my grandsons’ ceremonies last week. Now, I know that back in 1955, the world and I had a lot to learn. In 2018, I realized the grave difficulties both of my grandsons and all young Americans face today. And these young Americans are very much concerned about their future. A new poll from Harvard’s Kennedy Institute of Politics found more than two-thirds of young (18 to 29) adults are more fearful than hopeful about America’s future. Over 50% said the country is headed in the wrong direction; only 14% say we’re on the right path. And 67% think the greatest threats come from inside our country, rather than from external forces. They described the biggest threats as: President Donald Trump, “ourselves” and racism. Other new research conducted by health insurer Cigna concluded young people, ages 18 to 22, are the group most affected by loneliness, described as a major threat to Americans’ mental, physical and emotional well-being. Yet, the Youth Political Pulse survey from the Associated Press-NORC Center and MTV identified a surge of young people nationally who say they feel politically empowered, especially as a response to Florida’s Marjory Stoneman Douglas High School February shooting that killed 17. Can today’s young Americans change their world? A slim majority, 54% of ages 15 to 34, believe they have little or no effect on government, but an increased 46% of young people now believe they can have at least a moderate impact. Danville is an exceptional part of America, but you can argue, not typical. Nearly 45,000 folks live here in one of America’s wealthiest suburbs. It is one of the few remaining towns in the San Francisco Bay area with a plurality of registered Republicans. They voted in 1988 for Ronald Reagan to be president, 3-to-1, but a majority backed Barack Obama and Hillary Clinton. I came away from Patrick’s and Daniel’s graduations proud and pleased, but with a sense of guilt and sadness, knowing the world my generation has left them. Elgar’s music speaks of “a land of hope and glory.” Based on observation and careful listening, I do have a renewed hope for the future of America. That old reliable, Mark Twain, wrote: “The heart is the real fountain of youth.” Hopefully, young Americans such as these will provide America’s much-needed renewal. Editor’s Note: The “God Code” is a medical breakthrough that will have a profound impact on your life in the coming months and years. Sitting at just a $39 billion market today, this code could quickly dominate the $1.7 trillion health care industry … giving it the potential to skyrocket 4,250%. And those who invest as little as $50 in the company at the forefront of it all stand to make an absolute fortune. An opportunity like this only comes along once in a lifetime, so click here now to find out more.